Today's card is inspired by one I saw last month made by the VERY talented Barbara Anders. Click right here to see her beautiful card. I didn't have all the same dies she used, but I had some, so I just made my card based on the inspiration of her card. Because that flower is so dimensional, I didn't mail this card, but saved it for an occasion where I would just be handing someone the card. All of the dies are from MFT Stamps. You KNOW it's my favorite company on earth! 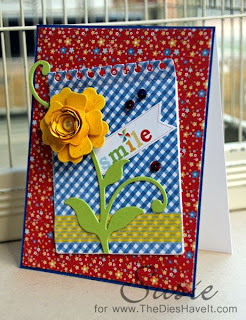 I hope you like my bright and sunny card today. Come on back tomorrow for another new project. OK? Wow, this is so fabulous, love the colors and the great design. Fabulous flower. your card is adorable. I love that flower and that the flower is dimenional. Very great style. Awwww! Susie, it's gorgeous! Love the bright happy colors and your perfectly made flower--this card would make anyone smile! Thank you so much for the ego boost this morning! !